Originally uploaded by Sumisu Yoshi. One of the boules close up. 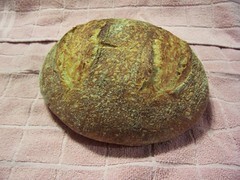 This is from the starter I will likely be keeping, as it rose better with both loaves. 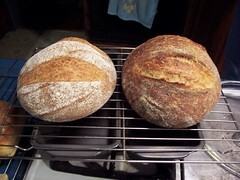 Both of the boules were baked using my pizza stone as a base, with the cloche bell lid over top. These rose better than they look like they did. They were a little small for the size loaf pan they were in. 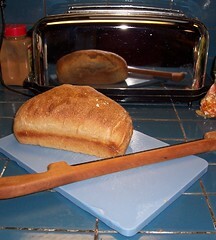 They both split really badly, but it is kind of hard to slash the top when it isn’t even close to the top of the loaf pan! Both sourdough, both the same recipe, turned out a little bit different. 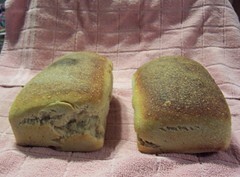 Mainly, the one on the left had more flour stick to it. A while a go I split my starter into two, because it didn’t seem to be doing well with whole wheat flour, I split some off and tried to get to whole wheat more slowly. Then both starters were loving whole wheat. So today I did a bakeoff. Two boules and two sandwich loaves. The one on the right here is the original starter, definitely rose more. 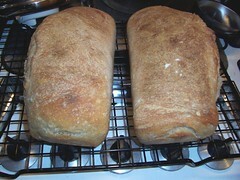 Seemed to do the same with the sandwich loaves as well. Two new loaves of Sourdough! As promised, here are the pictures. Both of them were made in loaf pans. The flavor on the one I cut open is definitely more sour, but also somehow more subtle. And the texture isn’t quite as heavy as the last few times I made sourdough. I used a recipe from the King Arthur Whole Wheat cookbook for these, and was quite happy with it. 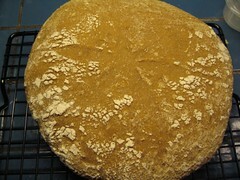 This one was ‘white whole wheat’ flour. It didn’t rise much at all. This is interesting and surprising because the sponge for this one rose fairly fast, and quite well. 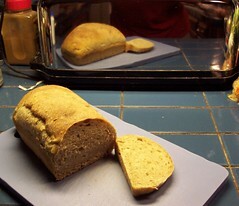 The sponges for the all purpose and bread flour loaves barely rose. Finished this one in the oven as the grill ran out of steam and it was too late to start coals again. I’m not quite sure I understand the starter though, the whole loving the wheat in the sponge hating it in the dough is confusing to me. Live and learn I guess.